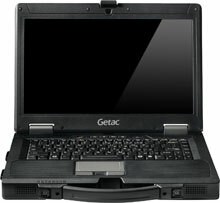 The Getac S400 is designed to be a durable, worry free semi-rugged computing solution. It is a perfect choice as a vehicle mounted solution. The S400 is one of the most rugged, semi-rugged notebook computers built. Using Getac's new KryptoShell body, the S400 is able to meet or exceed MIL-STD 810G criteria for temperature, shock and vibration as well as a 2.5 ft. drop on 6 faces. The S400 features a 14 inch wide-screen display that can be configured with features essential for field use including a 700 NITS display with glove-friendly multi-touch technology. Security is always a concern and the S400 is loaded with advanced security features including a fingerprint scanner, TPM 1.2 and a smart card reader. With an integrate Gobi 2000 mobile broadband card, the S400 can be easily configured for multi-carrier wireless deployments making it the ultimate durable communication tool.